A massive Roman ruin complex and arguably the most important historical site in all of Split, Diocletian's Palace is a must-see for visitors. 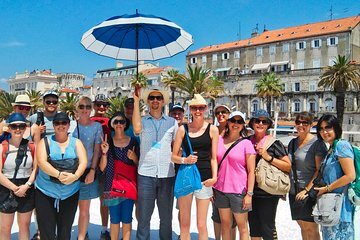 This tour takes you through 1,700 years of history within the walls of the UNESCO-listed historical complex, and then leads you to other top Split sites such as the City Clock, Riva Harbor, and Nardoni Trg plaza for a quick overview of Split highlights. Pick from among a range of walking tour departure times, and then meet your guide at Split’s Golden Gate near the Statue of Gregory of Nin. Spend the next two hours pounding the pavement as you explore hundreds of years of Split history on foot. Over the course of your walk you’ll sample the very best highlights of Split, stopping to check out attractions including Riva, City Hall, the Statue of Gregory of Nin, Peristil, St. Duje Cathedral, Diocletian’s Palace, Vestibul, and more. You’ll also get to learn more about Split’s rich architectural history and get an introduction some of its must-see art. You’ll finish back at your original starting point. Jelena was so friendly and extremely knowledgeable, we learnt so much and seen a lot we would've missed if we hadn't have booked this tour. I definitely recommend. Very Interesting and enjoyable. What an amazing introduction to Split. Our guide was a delight. He kept us thoroughly entertained throughout the tour with insider information about Split as well as the regular history. He paced the tour beautifully with enough time to look at things without rushing yet at the end of the tour we felt that we had seen and learnt a great amount. Our guide Natasa Dwac was wonderful. She knew the history, the art, and the architecture of the old city. She also explained current political affairs after being asked questions about it. Excellent tour with very knowledgeable guide. Well worth the price! My tour guide was Mio, very knowledgeable and had good sense of humor. Must do to get the basic introduction to the city. I usually start with hop-on hop-off, but Split is not designed for that type of tour, need to walk. Very knowledgeable guide with excellent English and a good way of putting her knowledge across. We were a small group of 6 and this no doubt helped as we moved around the area. Ina was an excellent guide. Definitely recommend this tour. This tour was great! Our guide, Jelena, was very informative and interesting. Highly recommend for a great history overview of this ancient city. Took the 2 hour tour with Danko- very knowledgeable guy. Very worthwhile and informative 2 hours- a great introductory overview of the history of Diocletians palace and the surrounding area.